The ENEC team at the nuclear plant site. THE Emirates Nuclear Energy Corporation (ENEC) said the construction of the concrete dome for the first reactor at its Barakah nuclear power plant has been completed. 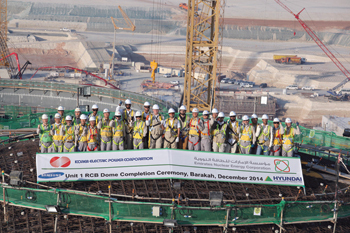 The completion of the Unit One dome marks another on-time milestone in the complex construction of the UAE’s first nuclear energy plant. The dome is the final structural component of the vast reactor containment building (RCB), which now measures more than 70 m in height. The RCB houses the nuclear reactor and is a critical structure in the nuclear plant’s defence-in-depth barriers. RCBs are extremely robust in design; with thick concrete walls and heavy reinforcing steel, they rank among the strongest structures in the world. They are designed to confine and contain radiation, even in the most extreme circumstances. Overall, Unit One is now more than 60 per cent complete and on track to commence commercial operations in 2017, pending further regulatory approvals. The timeline for the other nuclear energy plants is for Unit Two to begin operations in 2018, Unit Three in 2019 and the final Unit Four in 2020.